A little more than a year ago, I created a college basketball award tailored for walk-ons. Some are already calling it the single greatest award in the history of sports. Sure by “some” I actually mean “one guy,” and sure, that one guy may or may not be me, but that’s not really what matters right now. 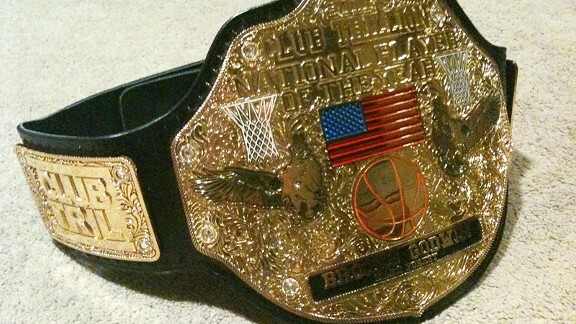 What matters is that for the first time ever, a college basketball award exists that superstars have virtually no chance at winning, and that award is a custom-made belt, inspired by the WWE Heavyweight Championship belt, that goes by the name of the Club Trillion National Player of the Year Belt. I’ll excuse myself and let you two get to know each other. I trust I now have your attention. As I mentioned earlier, the Club Trillion National Player of the Year Belt is essentially only for walk-ons, because the only way to win it is to record the most trillions over the course of the season. For those who don’t know, a “trillion” occurs when a player gets into the game but doesn’t record any statistics, resulting in his box score reading one minute played followed by a bunch of zeros. (Note: It doesn’t actually matter how many minutes are played, only that the player records no stats.) When I was a walk-on at Ohio State, my goal each and every game I played in was to get a trillion, so when I graduated I decided to create an award to celebrate the walk-ons who contribute nothing to the games that they play in like I always used to do. Since any player can get a trillion in any game, the award is open to all Division I players, but benchwarmers who play scrub time in the final minute or two of games have an advantage over guys who play more, because the chances of recording a statistic obviously increase with each minute on the court. Last season, Wake Forest’s Brooks Godwin cemented his name in the history books and was crowned the inaugural winner of the Club Trillion National Player of the Year Belt by posting a trillion in eight different games. My hope for this season is to make the contest even more competitive, but I need your help to do so. If you happen to be a Division I college basketball player, all I ask is that you e-mail us at triangle@grantland.com with your name and what school you play for to register yourself for the contest. And if you aren’t a Division I basketball player, all I ask is that you convince your favorite team’s benchwarmers (non-walk-ons are welcome to register, too!) to e-mail me their name and school. (I’m guessing the easiest way to do this would be to harass them via Twitter.) 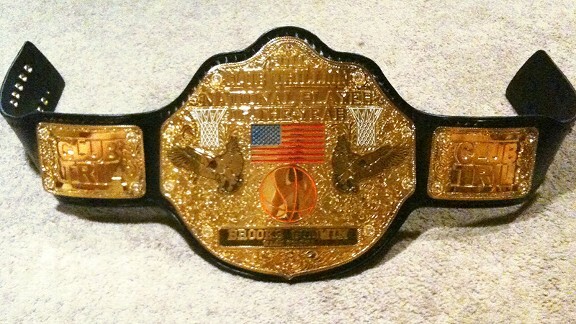 I know it’s kind of an inconvenience to make players register for the contest, but there are two perfectly good reasons why I’m requiring them to do so — I don’t want to give the belt to someone who doesn’t even know about it and/or wouldn’t appreciate it (though, let’s be honest, how can you not appreciate that? ), and we’re far too lazy to sift through box scores of every single Division I game this year to keep tabs on all the trillions throughout the country. So please don’t bombard us with e-mails of players who you think should be involved in the contest, because we’ll only include players who register themselves. I have a ton of respect for benchwarmers at every level of college basketball, but to keep the playing field level, I’ve decided to restrict the contest to just Division I players. (Again, you don’t have to be a walk-on or even a benchwarmer to enter the contest. In fact, I want nothing more than for superstar players to be included in this, which is why I’m going to convince Jared Sullinger to enter.) And by that I mean that I have no idea where to even begin to look up Division II or NAIA box scores, and I don’t want non-Division I players making my job more difficult. Maybe if this award gets enough momentum and becomes as big of a deal as I imagine it will, I’ll create different awards for Division II, Division III, and NAIA. But for now, it’s just for Division I players only. Sorry. Like I mentioned earlier, it doesn’t matter how long the player was on the court; it only matters that he didn’t do anything while he was out there. If a guy plays for four minutes and records no statistics whatsoever, it still counts to his total number of trillions on the year. (In the business, we would refer to this as a “four trillion.”) And there are sometimes rare occasions when a player will play for less than 30 seconds and his box score will have a “0+” in the minutes played column, which is referred to as the coveted “0+ trillion.” All that matters from a playing-time perspective is that the player checked into the game. Technically, it doesn’t even matter if any time runs off the clock. Just so long as he officially enters the game and he records no stats (points, field goal attempts, rebounds, assists, steals, turnovers, blocks, fouls, and anything else I forgot about), it counts as a trillion. Sometimes a game will produce conflicting box scores, so to establish consistency and to avoid any discrepancies, the box scores on ESPN’s website will be the official box scores for the contest. This is pretty self-explanatory, but I do want to take a second to clarify that all postseason games from every postseason tournament are included, not just the NCAA tournament. In the event of a tie, the winner will be decided by adding up the minutes played in only the games in which trillions were recorded. The more time a player spends on the court, the higher the probability that he’ll record a statistic, which means that this tiebreaker is advantageous for those who are really committed to not doing anything with their playing time. (Anyone can get a 0+ trillion, but it takes real talent to get a 10 trillion or higher.) In other words, if the quantity of trillions is the same between two players, the quality of the trillions will decide the winner. I think that just about does it. Don’t forget to persuade your favorite team’s players to e-mail us at triangle@grantland.com with their name and the school. That way you can cheer them on all season long as they rack up trillions in pursuit of college basketball’s most coveted award — the Club Trillion National Player of the Year Belt. May the best (read: most irrelevant) man win!